For other uses of the word "kris", see Kris (disambiguation). For other uses of the word "KERIS", see KERIS (disambiguation). The kris (ngoko Javanese: ꦏꦼꦫꦶꦱ꧀ ; krama inggil Javanese: ꦮꦁꦏꦶꦔꦤ꧀; ngoko: keris; krama; dhuwung; krama inggil: wangkingan, lit. "to slice"; Minangkabau: karih, Bugis and Makassarese: sele, Balinese and Sasak: keris, Jawi: کريس, Thai: กริช krich, Tagalog: kalis) is an asymmetrical dagger with distinctive blade-patterning achieved through alternating laminations of iron and nickelous iron (pamor). Kris is most strongly associated with the culture of Indonesia. The kris is famous for its distinctive wavy blade, although many have straight blades as well. Kris have been produced in many regions of Indonesia for centuries, but nowhere—although the island of Bali comes close—is the kris so embedded in a mutually-connected whole of ritual prescriptions and acts, ceremonies, mythical backgrounds and epic poetry as in Central Java. As a result, in Indonesia the kris is commonly associated with Javanese culture, although other ethnicities are familiar with the weapon as part of their culture, such as the Balinese, Malays, Sundanese, Madurese, Banjar, Bugis, and Makassar. A kris can be divided into three parts: blade (bilah or wilah), hilt (hulu), and sheath (warangka). These parts of the kris are objects of art, often carved in meticulous detail and made from various materials: metal, precious or rare types of wood, or gold or ivory. A kris's aesthetic value covers the dhapur (the form and design of the blade, with around 60 variants), the pamor (the pattern of metal alloy decoration on the blade, with around 250 variants), and tangguh referring to the age and origin of a kris. Depending on the quality and historical value of the kris, it can fetch thousands of dollars or more. Both a weapon and spiritual object, kris are often considered to have an essence or presence, considered to possess magical powers, with some blades possessing good luck and others possessing bad. Kris are used for display, as talismans with magical powers, weapons, a sanctified heirloom (pusaka), auxiliary equipment for court soldiers, an accessory for ceremonial dress, an indicator of social status, a symbol of heroism, etc. Legendary kris that possess supernatural power and extraordinary ability were mentioned in traditional folktales, such as those of Empu Gandring, Taming Sari, and Setan Kober. In 2005, UNESCO gave the title Masterpiece of the Oral and Intangible Heritage of Humanity to the kris of Indonesia. The word kris derives from the Old Javanese term ngiris (Javanese: ꦔꦶꦫꦶꦱ꧀) which means to slice, wedge or sliver. "Kris" is the more frequently used spelling in the West, but "keris" is more popular in the dagger's native lands, as exemplified by the late Bambang Harsrinuksmo's popular book entitled Ensiklopedi Keris (Kris Encyclopedia). Two notable exceptions are the Philippines where it is usually called kalis or kris (although the Filipino kalis is a sword, rather than a dagger), and Thailand where it is always spelled kris and pronounced either as kris or krit. In the Yala dialect the word is kareh. Other spellings used by European colonists include "cryse", "crise", "criss", "kriss" and "creese". Kris depicted on Borobudur bas-relief. Kris history is generally traced through the study of carvings and bas-relief panels found in Southeast Asia. It is believed that the earliest kris prototype can be traced to Dongson bronze culture in Vietnam circa 300 BC that spread to other parts of Southeast Asia. Another theory is that the kris was based on daggers from India. Some of the most famous renderings of a kris appear on the bas-reliefs of Borobudur (825) and Prambanan temple (850). Kris blacksmith's workshop depicted in 15th century Candi Sukuh. 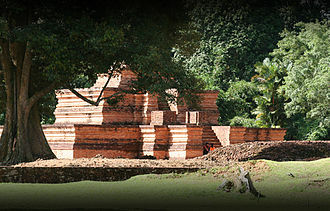 However, Raffles' (1817) study of the Candi Sukuh states that the kris recognized today came into existence around 1361 AD in the kingdom of Majapahit, East Java. The scene in bas relief of Sukuh Temple in Central Java, dated from 15th century Majapahit era, shows the workshop of a Javanese keris blacksmith. The scene depicted Bhima as the blacksmith on the left forging the metal, Ganesha in the center, and Arjuna on the right operating the piston bellows to blow air into the furnace. The wall behind the blacksmith displays various items manufactured in the forge, including kris. These representations of the kris in the Candi Sukuh established the fact that by the year 1437 the kris had already gained an important place within Javanese culture. "all men in Majapahit, from the king to commoners, from a boy aged three to elders, slipped pu-la-t'ou (belati or more precisely kris dagger) in their belts. The daggers are made entirely of steel with intricate motifs smoothly drawn. The handles are made of gold, rhino's horn or ivory carved with a depiction of human or demon; the carving works are exquisite and skillfully made." This Chinese account also reported that public execution by stabbing using this type of dagger is common. Majapahit knows no caning for major or minor punishment. They tied the guilty men's hands in the back with rattan rope and paraded them for a few paces, and then stabbed the offender one or two times in the back on the gap between the floating ribs, which resulted in severe bleeding and instant death. The Kris of Knaud exhibited at the Amsterdam Museum of the Tropics. Currently, the Kris of Knaud is the oldest known surviving kris in the world. Given to Charles Knaud, a Dutch physician, by Paku Alam V in the 19th century Yogyakarta in Java, the kris is on display at the Tropenmuseum, Amsterdam. The kris bears the date of 1264 Saka (which correspondends to 1342 AD) in its iron blade. Scientists suspect that due to its special features the kris might be even older, but was decorated during Majapahit period to celebrate an important event. The kris bears scenes from the Ramayana on an unusual thin copper layer which partially covers it. Although the people of Southeast Asia were already familiar with this type of stabbing weapon, the development of the kris most probably took place in Java, Indonesia. 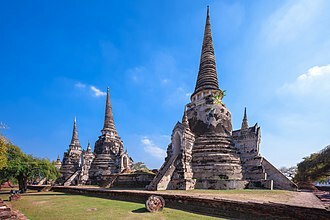 The spread of the kris to other nations such as Thailand, Malaysia and the Philippines, experts say, was credited to the growing influence of the Majapahit Empire in Java around the year 1492. The Sanghyang siksakanda ng karesian canto XVII, a Sundanese manuscript dated from Saka 1440 or 1518 AD, describes the kris as the weapon of kings, while the kujang is the weapon of farmers. There exist claims of earlier forms predating the Majapahit kris but none are verifiable. In the past, the majority of kris had straight blades but this became less frequent over time. Tomé Pires, in the early 16th century, describes the importance of the kris to the Javanese. While it is commonly believed that kris were the primary weapons wielded by fighters in the past, they were actually carried by warriors as a secondary armament if they lost their main weapon, which was usually a spear. For commoners however, kris were worn on a daily basis, especially when travelling because it might be needed for self-defense. During times of peace, people wore kris as part of ceremonial attire. 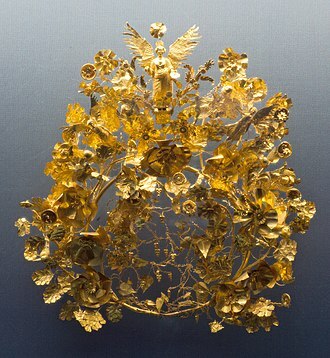 Ceremonial kris were often meticulously decorated with intricate carving in gold and precious stones. Heirloom blades were handed down through successive generations and worn during special events such as weddings and other ceremonies. Men usually wore only one kris but the famous admiral Hang Tuah is said in the Hikayat Hang Tuah to have armed himself with one short and one long kris. Women also wore kris, though usually of a smaller size than a man's. In battle, a fighter might have carried more than one kris; some carried three kris: his own, one from his father-in-law, and one as a family heirloom. The extra two served as parrying daggers, but if none were available the sheath would serve the same purpose. Kris were often broken in battle and required repairs. Yearly cleanings, required as part of the spirituality and mythology surrounding the weapon, often left ancient blades worn and thin. The repair materials depended on location and it is quite usual to find a weapon with fittings from several areas. For example, a kris may have a blade from Java, a hilt from Bali and a sheath from Madura. In many parts of Indonesia, the kris used to be the choice weapon for execution. The executioner's kris had a long, straight, slender blade. The condemned knelt before the executioner, who placed a wad of cotton or similar material on the subject's shoulder or clavicle area. The blade was thrust through the padding, piercing the subclavian artery and the heart. Upon withdrawal, the cotton wiped the blade clean. Death came within seconds. A lithograph depiction of kris blacksmith in Java, Dutch East Indies circa 1854. In the 16th century, European colonial power introduced firearms into the archipelago that contribute to the decline of kris' prominence as the weapon of choice in battle. The forging of the edged weapons went into decline from the moment that the sultans or rajas were subjugated and their realms annexed by the British or Dutch East Indies colonial state. In number of regions, a ban was placed on carrying of cutting and stabbing weapons. 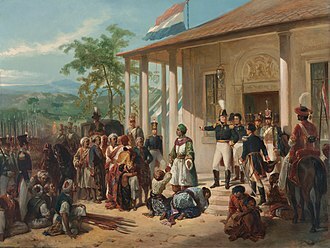 In Java, the turning point was the end of the five-year-long Java War when the rebellious Prince Diponegoro was defeated and detained, and had to hand his kris over to the Dutch in 1830. This event marked the disarmament of the kris as a combat weapon among the Javanese populace. Its ceremonial function, however, as part of traditional costumes, as sacred heirloom and as a protective personal amulet, remains. The early 20th century saw the decline of kris forging as carrying edged weapons was banned in the Dutch East Indies. However its spiritual and ceremonial function still continues and is celebrated mainly in kraton and istana (courts) throughout Indonesia, Malaysia and the Muslim-inhabited parts of the southern Philippines. However, the kris saw continuous use and forging in the Philippines, which comprised most of the Spanish East Indies. While the majority of the natives and locals in the archipelago accepted Roman Catholicism, the Muslims of the southern regions fiercely resisted Spanish rule. The kris provided the Muslim armies with their counterpart to the Spanish weaponry and it became an alarming concern for the Spanish armies. Kris-forgers and swordsmen were referred to as juramentados by the Spanish. Juramentados practice a ritual of sacrifice, a form of Jihad against not only Spanish soldiers, but also against Christian Filipinos alike. 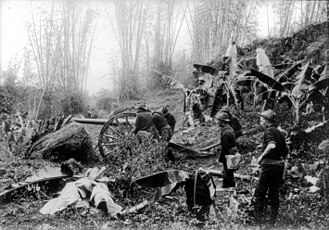 Juramentados were specially-trained and chosen fighters. Candidates were known as mag-sabil or ""who endure the pangs of death". These had their parents consulted, and the Sultan would permit them to undergo the training for Parang-sabil or the "path to Heaven". 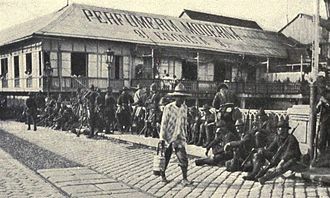 During the Philippine–American War, the death of American soldiers at the hands of kris-wielding Moros and other Filipinos armed with blades led to the creation and use of the Colt M1911. During World War II, the kris were accompanied by other Moro swords such as barongs in the insurgency movement against Japanese occupation. 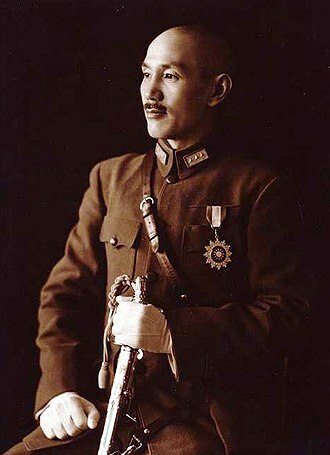 Kris worn by Yogyakarta Sultan's palace guard. In Java, the traditional art of kris-making is preserved in the Javanese culture heartland, the keraton (royal court) of Yogyakarta and Surakarta, and also the princedom of Mangkunegaran and Pakualaman. The Javanese kings and nobles of these courts are known to employ some kris blacksmiths (empu) and become the patrons of their works, although the activity of kris-making is declining. Until the 1990s, kris-making activities in Java had almost come to a standstill due to economic difficulties and changing socio-cultural values. However, thanks to several concerned kris experts, the tradition is being revived and kris craftsmanship has increased again. Over the past three decades, kris have lost their prominent social and spiritual meaning in society. Although active and honoured smiths who produce high quality kris in the traditional way can still be found in some places such as Madura, Surakarta, Yogyakarta, Makassar and Palembang, their number is dramatically decreasing, and it is more difficult for them to find successors to whom they may transmit their skills. The traditional kris-making industry still survives in some villages, such as Banyu Sumurup village in Imogiri subdistrict, Bantul, Yogyakarta, either specially made as a sacred amulet ordered by a kris enthusiast who seeks its spiritual power, or merely as souvenirs for tourists. Kris made in the Philippines are often in variants, with half-wavy half-straight blades. It has become an essential and symbolic weapon to Moro culture, much as it is associated with Javanese cultures. A kris's aesthetic value covers the dhapur (the form and design of the blade, with around 150 variants), the pamor (the pattern of metal alloy decoration on the blade, with around 60 variants), and tangguh referring to the age and origin of a kris. A decorative kris with a figure of Semar as the handle. The blade has thirteen luk. The kris blade is called a wilah or bilah. Kris blades are usually narrow with a wide, asymmetrical base. The kris is famous for its wavy blade; however, the older types of kris dated from the Majapahit era have straight blades, as do more than half of all kris prior to the modern era. The number of curves on the blade (known as luk or lok) is always odd. Common numbers of luk range from three to thirteen waves, but some blades have up to 29. In contrast to the older straight type, most kris today have a wavy blade which is supposed to increase the severity of wounds inflicted upon a victim. According to traditional Javanese kejawen, kris contain all the intrinsic elements of nature: tirta (water), bayu (wind), agni (fire), bantolo (earth, but also interpreted as metal or wood which both come from the earth), and aku (lit: "I" or "me", meaning that the kris has a spirit or soul). All these elements are present during the forging of kris. Earth is metal forged by fire being blown by pumped wind, and water to cool down the metal. In Bali, the kris is associated with the nāga or dragon, which also symbolizes irrigation canals, rivers, springs, wells, spouts, waterfalls and rainbows; thus, the wavy blade symbolizes the movement of the serpent. Some kris have the head of a naga (dragon) carved near the base with the body and tail following the curves of the blade to the tip. A wavy kris is thus a naga in motion, aggressive and alive; a straight blade is one at rest, its power dormant but ready to come into action. In former times, kris blades were said to be infused with poison during their forging, ensuring that any injury was fatal. The process of doing so was kept secret among smiths. Different types of whetstones, acidic juice of citrus fruits and poisonous arsenic bring out the contrast between the dark black iron and the light colored silvery nickel layers which together form pamor, damascene patterns on the blade. The shiny nickelous pattern (pamor) on dark iron background visible on kris' blade. The distinctive pamor patterns have specific meanings and names which indicate the mythical properties they are believed to impart. There are around 60 variants of pamor recognized today in traditional kris blades. Some examples of pamor include beras wutah, udan mas, kembang kacang, kembang pala and ladrang cendana. The kris blade forging uses iron with a small content of nickel to create this pattern. The faint pamor pattern has been found in the kris from Majapahit period, which was acquired from iron ores with small nickel content. 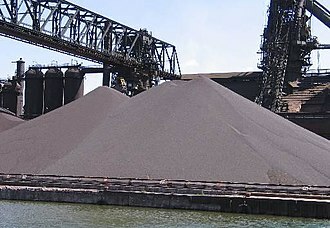 Most probably this iron ore was imported from the island of Sulawesi, as the pamor Luwu from Luwu region is quite well known in Sulawesi and Java. 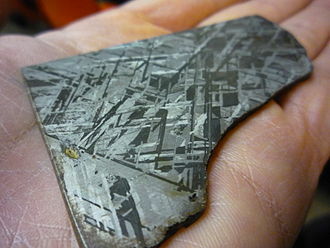 The best material for creating pamor however, is acquired in a quite unusual way, as it is made from rare meteorite iron. Traditionally the pamor material for the kris smiths connected with the courts of Yogyakarta and Surakarta originates from an iron meteorite that fell to earth at the end of 18th century in the neighborhood of the Prambanan temple complex. The meteorite was excavated and transported to the keraton of Surakarta; from that time on the smiths of Vorstenlanden (the Royal territories) used small pieces of meteoric iron to produce pamor patterns in their kris, pikes, and other status weapons. After etching the blade with acidic substances, it is the small percentage of nickel present in meteoric iron that creates the distinctive silvery patterns that faintly light up against the dark background of iron or steel that become darkened by the effect of the acids. Wikimedia Commons has media related to Kris hilts. Richly decorated Balinese kris hilt coated with gold, adorned with rubies. The handle or hilt (hulu) is an object of art, often carved in meticulous details and made from various materials: precious rare types of wood to gold or ivory. They were often carved to resemble various animals and Hindu deities, although this became less common with the introduction of Islam. In Bali, kris handles are made to resemble demons coated in gold and adorned with semi precious and precious stones, such as rubies. In Java, kris handles are made in various types, the most common design being the abstract stylized representation of the human form. Examples of hilt designs include Tunggak Semi Putri Kinurung hilt from Surakarta, Batara Guru and Pulasir hilt from Madura, Punukan hilt from Palembang, Ratmaja from Bali, Pulungan hilt from Cirebon, Pekaka hilt from Pattani, and a seabird-like hilt from Lampung and Sulawesi. The kris usually has a curved pistol-grip hilt that aids in stabbing strikes. It allows the palm of the holding hand to add pressure to the blade while stabbing. A kris only offers minimal protection for the hand by the broad blade at the hilt. Keris sheath of Ladrang Surakarta style. As with the hilt, a kris' sheath (warangka) is also an object of art. It can be made from various materials, usually a wooden frame to hold the blade which can be coated with metals such as brass, iron, silver, or even gold, usually carved in sulur floral motifs. The upper part of the sheath formed a broad curved handle made from wood or sometimes ivory. It could be adorned with precious or semi-precious stones. The making of a kris was the specialised duty of metalworkers called empu (lit. "possessor") or pandai besi (lit. "iron-skilled"). In Java the honorary title empu refer to those ironsmiths who possess the special skill of forging the kris. According to Javanese beliefs, a kris empu should possess knowledge, technical skills and also spiritual prowess, since kris are believed to have physical and spiritual presence. This was meant to differentiate the masters from common pandai besi that mostly create common metal tools or peasant's weapons like parang or golok. In old Majapahit, a kris bladesmith was referred to as pande and all were reputed to be able to work hot iron with their bare hands. 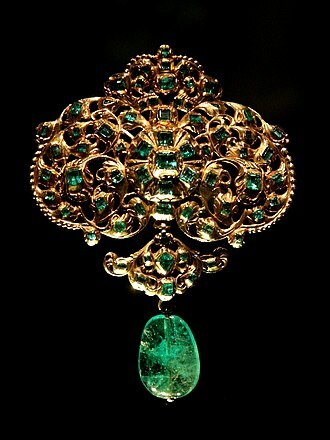 The people of Majapahit would eventually flee to Bali where the occupation has been preserved by the Pande clan to this day, members of whom also make jewellery. 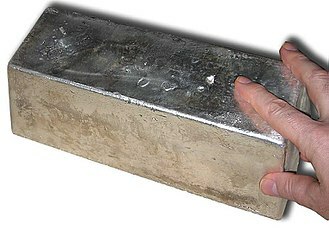 A bladesmith makes the blade in layers of different iron ores and meteorite nickel. Some blades can be made in a relatively short time, while more intricate weapons take years to complete. In high quality kris blades, the metal is folded dozens or hundreds of times and handled with the utmost precision. Empu are highly respected craftsmen with additional knowledge in literature, history, and the occult. Various ways of wearing kris in Javanese culture. Kris were worn at special ceremonies, with heirloom blades being handed down through successive generations. Both men and women might wear them, though those for women are smaller. A rich spirituality and mythology developed around the weapon. Kris are used for display, as talismans with magical powers, weapons, sanctified heirloom, auxiliary equipment for court soldiers, as an accessory for ceremonial dress, an indicator of social status, a symbol of heroism, etc. In Javanese culture the kris is revered as tosan aji (Javanese for "sacred heirloom weapon") and considered a pusaka. The kris is believed to have the ability to infuse bravery upon its holder: this property is known as piyandel in Javanese which means "to add self-confidence". The pusaka kris or kris-tipped spear given by a Javanese king to nobles or his subjects, was meant to symbolize the king's confidence bestowed upon the receiver and is considered a great honor. During the Javanese wedding ceremony, a kris is required to be adorned with chains of jasmine flower arrangement as an important part of Javanese groom's wedding costume. The addition of jasmine arrangement around the kris was meant as a symbol that a man should not easily be angry, cruel, fierce, too aggressive, tyrannical and abusive. Barong dance performance with kris-wielding dancers and Rangda in Bali. Kris-makers did more than forge the weapon, they carried out the old rituals which could infuse the blade with mystical powers. For this reason, kris are considered almost alive because they may be vessels of spirits, either good or evil. Legends tell of kris that could move of their own volition and killed individuals at will. Some kris are rumored to stand upright when their real names are called by their masters. It was said that some kris helped prevent fires, death, agricultural failure, and many other problems. Likewise, they could also bring fortune, such as bountiful harvests. Many of these beliefs were derived from the possession of different kris by different people. For example, there is a type of kris in Java that was called Beras Wutah, which was believed to grant its possessor an easy life without famine. This kris was mainly assigned to government officers who were paid, in whole or in part, with foodstuffs such as rice. There are several ways of testing whether a kris is lucky or not. A series of cuts on a leaf, based on blade width and other factors, could determine if a blade was good or bad. Also, if the owner slept with the blade under their pillow, the spirit of the kris would communicate with the owner via dream. If the owner had a bad dream, the blade was unlucky and had to be discarded, whereas if the owner had a good dream the dagger would bring good fortune. However, just because a blade was bad for one person didn't mean it would be bad for another. Harmony between the weapon and its owner was critical. Because some kris are considered sacred and believed to possess magical powers, specific rites needed to be completed to avoid calling down evil fates which is the reason warriors often made offerings to their kris at a shrine. There is also the belief that pointing a kris at someone means they will die soon, so silat practitioners precede their demonstrations by touching the points of the blades to the ground so as to neutralise this effect. 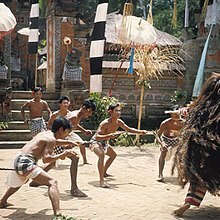 In the Barong dance of Bali there is a segment in which the villain Rangda magically enchants Airlangga's soldiers to commit suicide while another magician makes them invulnerable to sharp objects. In a trance state, the male dancers stab themselves in the chest with their own kris but remain unhurt. Several folktales—linked to historical figures—mention legendary kris that possess supernatural power and extraordinary ability. Most of the magical kris are of Javanese origin, while the tales are derived from Javanese ancient manuscript, Babad (Javanese chronicle) and the Sejarah Melayu of Malaysia. One of the most famous legends from Java comes from the Pararaton (Book of Kings). It describes a legendary bladesmith called Mpu Gandring or Empu Gandring and his impatient customer, Ken Arok, in the last days of the Kediri kingdom in the 13th century. The customer ordered a powerful kris to kill the mighty chieftain of Tumapel, Tunggul Ametung. Ken Arok eventually stabbed the old bladesmith to death because he kept delaying the scheduled completion of the kris. Dying, the bladesmith cursed the kris through prophecy that the unfinished or incomplete kris would kill seven men, including Ken Arok. Ken Arok used Mpu Gandring's cursed kris to assassinate Tunggul Ametung, cunningly put the blame to Kebo Ijo, and built a new kingdom of Singhasari. The prophecy finally came true, with four men enlisted as the kris' first death roll, including Mpu Gandring himself, Tunggul Ametung, Kebo Ijo to whom Ken Arok lent the weapon, and finally Ken Arok himself. The unfinished kris then disappeared. The Kris Taming Sari as seen third from the left, among the rest of the Perak royal regalia, 1907. 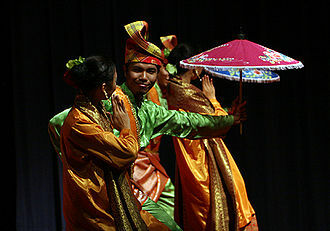 Taming Sari ("flower shield") is one of the most well-known kris in Malay literature, said to be so skilfully crafted that anyone wielding it was unbeatable. In some versions of the legend, the weapon would grant its user physical invulnerability. The legend took place sometime during the fall of Majapahit Empire and the rise of the Malacca Sultanate in the 15th century. 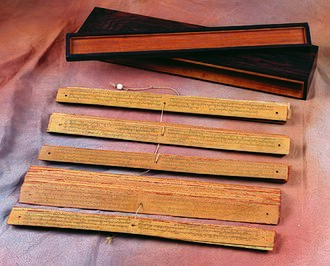 Tun Sri Lanang's book, the Sejarah Melayu, tells that it was made by a Javanese empu and first used by the champion of Majapahit, a pendekar named Taming Sari. He was defeated in a duel to the death by the Melakan admiral Hang Tuah, after which the king of Majapahit presented the weapon to the victor. After being framed by a jealous official, Hang Tuah was ordered to be executed, but he managed to escape and go into hiding with the help of a minister who knew the truth. Hang Tuah's kris and title of Laksamana (admiral) were passed on to his comrade Hang Jebat. Furious that his best friend was unfairly put to death, Hang Jebat rebelled against the royalty and took over the palace. The desperate ruler of Melaka pardoned the minister so long as Hang Tuah could win him back the throne. Having trained under the same master since childhood the two friends were nearly equals but of the two, Tuah was the superior fighter. However, even after a long battle in the palace, neither could best the other because the Kris Taming Sari evened the odds. Only after taking his weapon back did Hang Tuah manage to stab Jebat, who died soon after. Another Javanese folk story tells of Arya Penangsang, the mighty viceroy (adipati) of Jipang who was killed by his own kris called Setan Kober ("devil of the grave"). It was forged by Empu Bayu Aji in the kingdom of Pajajaran, and had 13 luk on its blade. Near its completion when the empu tried to infuse the weapon with spiritual power, he was disturbed by a crying demon (djinn) from the graveyard. As a result, although powerful, the kris had a temperamental evil nature that caused the wielder to be overly ambitious and impatient. The story took place in the 16th century, during the fall of Demak Sultanate that had replaced Majapahit as the ruler of Java. Setan Kober was safely kept by Sunan Kudus, one of the nine Islamic saints of Java. However Sunan Prawoto, son of Prince Trenggana and grandson of Raden Patah, stole it and used it to assassinate his uncle Raden Kikin by the river. Since then, Raden Kikin is also referred to as Sekar Seda Lepen (flower that fell by the river). Raden Trenggana rose as a sultan and later after his death, was replaced by Sunan Prawoto. Kikin's son, Arya Penangsang of Jipang with the help of his teacher, Sunan Kudus, took revenge by sending an assassin to kill Prawoto using the Setan Kober kris. Prawoto younger sister Ratu Kalinyamat seeks revenge on Penangsang, since Penangsang also murdered her husband. She urged her brother in-law, Hadiwijaya (Joko Tingkir) the ruler of Pajang, to kill Arya Penangsang. Hadiwijaya sent his adopted son and also his son in-law Sutawijaya, who would later become the first ruler of the Mataram dynasty. 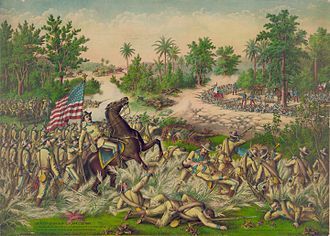 During a battle, Sutawijaya stabbed Penangsang with Kyai Plered spear right in his gut. Arya Penangsang is bathing in his own blood, and his intestines were hanging from his open wounded stomach. However, because Arya Penangsang is a mighty fighter that possess aji or kesaktian (spiritual power), he keep fighting with an open wounded stomach. He encircled his hanging intestines on his kris hilt, and continue to fight. When trying to attack his opponent, the reckless, fierce and impatience Panangsang pulled his Setan Kober off its sheath, foolishly cut his own intestines, and finally died. 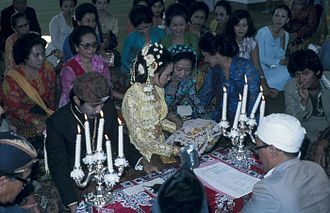 The Javanese tradition of putting jasmine garlands around the kris hilt, especially on groom's kris during the wedding ceremony, is said to originate from this tale. It is to symbolyze that the groom should not be reckless, easily get angry, impatient and abusive like Arya Panangsang. To replace the intestine, the kris is coiled with a floral garland of jasmine chain that resemble intestine. The jasmine is to symbolize sacredness, patience, grace, humility, kindness and benevolence, the qualities lack in Panangsang. However another source mentioned that actually Sutawijaya admired Penangsang's fighting spirits, still fighting although his intestine encircled around his kris. Impressed by Penangsang's deed, later he command his male descendants to follow his step, adorned the kris with "intestine" made from the chain of jasmine, as a symbol of bravery. The story of Arya Penangsang has inspired and performed as Javanese ketoprak drama. Throughout the archipelago, kris is a symbol of heroism, martial prowess, power and authority. As a cultural symbol, the meticulously decorated keris represent refinement, art and beauty, as the pride and prized possession for its owner; however, as a weapon it is associated with violence, death and bloodshed. Probably for this reason, although the kris is widespread in Javanese culture, it is not used to symbolise Javanese culture or royalty, as Javanese tradition promotes harmony and discourages direct confrontation (hence the absence of knives on Indonesian dinner tables). 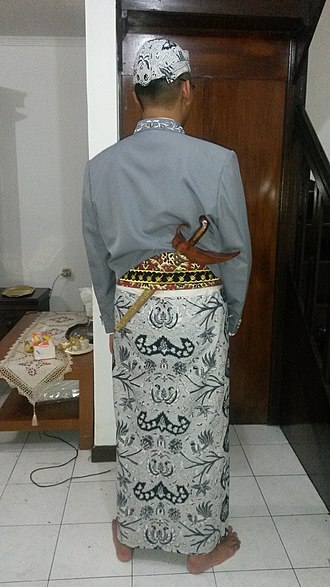 This is also why the Javanese traditionally wear the kris on their back, to symbolize violence as the last resort. However, in other parts of archipelago, from Sumatra to the Malay Peninsula and to Sulawesi, the kris is worn on the front or left side on the hip. The kris is depicted on different flags, emblems, coats and logos such as those of the Mataram Sultanate, Riau Islands Province, Terengganu and Selangor. The former emblem of Siam uses the kris to represent the southern territories. It can also be seen on an obverse copper-zinc-tin RM1 coin with a songket pattern in the background. The Malaya and British Borneo dollar 1 cent coin of 1962 also depicted a pair of crossed kris. 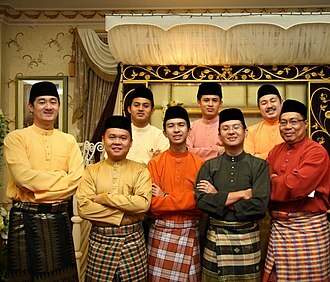 Since the independence of Malaysia, the kris has become something of a symbol of Malay nationalism. It is still regarded by some as a symbol of ketuanan Melayu, the doctrine of the Malay race as the dominant race at their homeland, and has been incorporated into the Sang Saka Bangsa, the official flag of the United Malays National Organisation. In the Philippines, the kalis, a larger sword variant of the kris, is a symbol of Moro and southern Filipino culture, and a resistance to Spanish rule and influence. It is incorporated into the flags of the Moro National Liberation Front and the Moro Islamic Liberation Front. It has also been incorporated into the historical flags of the Sultanate of Sulu, as well as the emblem of the Cotabato Province. ^ a b Tantri Yuliandini (April 18, 2002). "Kris, more than just a simple dagger". The Jakarta Post. Archived from the original on 29 July 2014. Retrieved 30 July 2014. ^ Groneman, Isaäc (2009). "The Javanese Kris" (PDF). Leiden: Leiden and KITLV Press: 27. Archived from the original (PDF) on 10 August 2014. Retrieved 29 July 2014. ^ Frey, Edward (1989). The Kris: Mystic Weapon of the Malay World. Selangor Darul Ehsan: Oxford University Press. ISBN 0-1958-8906-1. ^ Draeger & Smith (1969). Comprehensive Asian Fighting Arts. ISBN 978-0-87011-436-6. ^ Ma Huan (1970) . Ying-yai Sheng-lan (瀛涯胜览) The Overall Survey of the Ocean's Shores. Hakluyt Society (in Chinese). translated by J.V.G Mills. Cambridge University Press. ISBN 9780521010320. ^ van Duuren, David (2002). Krisses: a critical bibliography. Pictures Publishers. p. 110. ISBN 978-90-73187-42-9. Retrieved 6 March 2011. ^ Pires, Tomé (1990). The Suma Oriental of Tome Pires: An Account of the East. New Delhi: Asian Educational Services. p. 179. ISBN 81-206-0535-7. ^ Groneman, Isaäc (2009). "The Javanese Kris" (PDF). Leiden: Leiden and KITLV Press: 30. Archived from the original (PDF) on 10 August 2014. Retrieved 29 July 2014. ^ Slamet Susanto (April 2, 2005). "Banyu Sumurup survives as kris village". The Jakarta Post. Archived from the original on 8 August 2014. Retrieved 30 July 2014. ^ Gateway To Malay Culture. Asiapac. 2004. ISBN 978-9812293268. ^ a b c d "Keris: Bawa Rasa Tosan Aji" (in Indonesian). Karaton Surakarta. Archived from the original on 2013-12-22. Retrieved 2011-10-24. ^ "Keris dan Budaya Spiritual Kejawen" (in Indonesian). Kalalima. 22 August 2011. Archived from the original on 28 April 2013. Retrieved 2 July 2012. ^ "Magic of Metal, Spiritual and Physical Powers of Keris". Neka Art Museum, Bali. Retrieved 2011-10-24. ^ Groneman, Isaäc (2009). "The Javanese Kris" (PDF). Leiden: Leiden and KITLV Press: 19. Archived from the original (PDF) on 10 August 2014. Retrieved 29 July 2014. ^ "Bentara Budaya Jakarta, Pameran Ragam Hulu Keris Nusantara". Java Keris. 9 July 2011. Retrieved 2011-10-24. ^ "The Spiritual Power of the Keris". Ancient Keris. Archived from the original on 2015-09-04. ^ Indonesian Myth, Cursed Sword. ^ ThingsAsian.com, Keris – Is it merely a sword? David van Duuren, The Kris; An Earthly Approach to a Cosmic Symbol. Wijk en Aalburg (The Netherlands): Pictures Publishers, 1998. David van Duuren, Krisses; A Critical Bibliography. Wijk en Aalburg (The Netherlands): Pictures Publishers, 2002. Vic Hurley; Christopher L. Harris (1 October 2010). Swish of the Kris, the Story of the Moros, Authorized and Enhanced Edition. Cerberus Corporation. ISBN 978-0-615-38242-5. W.H. Rassers, 'On the Javanese kris', in: Bijdragen tot de Taal-, Land- en Volkenkunde 99, 1940, pp. 377–403. Surprising find at Okinawa temple – The Star online. Wikimedia Commons has media related to Kris. The Makassar people are an ethnic group that inhabits the southern part of the South Peninsula, Sulawesi. 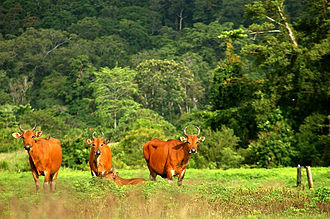 They live around Makassar, the city of the province of South Sulawesi, as well as the Konjo highlands, the coastal areas. They speak Makassarese, which is related to Buginese and a Malay creole called Makassar Malay. The main source of income of the Makassar is rice farming, they are famous throughout Indonesia for their skill in trading. Labor division is strict because of the separation of the sexes. Men are engaged in matters outside the house such as farming, women are usually responsible for the household duties, while the man is the head of the family. While they are in public, respect should be shown to him by the wife, usually the final decisions concerning the family are made by the husband. In rural areas, arranged marriage is widely practiced. 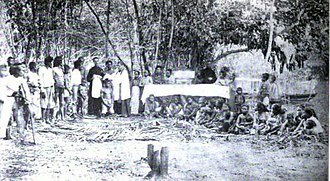 Polygamy is accepted by the Makassar people, since a house must be provided for each wife. Siri is the code by which the Makassar live. Anyone seriously offending another persons siri carries the risk of being killed, the Makassar often help their neighbors in matters such as working in the rice fields and building houses. Also referred to as Basa Mangkasara is the language spoken by the tribes of Makassar, South Sulawesi and this language is classified as part of Makassarese sub-branch of South Sulawesi branch which in turn part of the Malayo-Polynesian branch of the Austronesian language family. Commonly known as Logat Makassar is a creole of Malay and this language is used as the language of commerce in the port of Makassar, South Sulawesi. 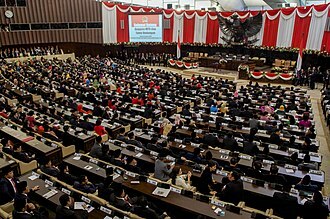 The number of speakers is reached 1.889 million inhabitants in 2000, the language is mostly used by Immigrants from outside the city of Makassar, Makassar City Population, Youth Makassar, or people who are not proficient in Makassarese. This language is spoken along the South Peninsula region of Sulawesi, the Makassar are almost all Muslim, but some traditional beliefs are still influential, especially in the remote areas. Ahmad Hidayat in his article titled Islamic History Up to the archipelago said Datori Bandang are scholars who propagated Islam in the territory of the Kingdom of Gowa, while two other colleagues, each spread Islam in the region and in the Kingdom of Luwu Bulukumba. Bali is an island and province of Indonesia. The province includes the island of Bali and a few smaller neighbouring islands, notably Nusa Penida, Nusa Lembongan and it is located at the westernmost end of the Lesser Sunda Islands, between Java to the west and Lombok to the east. Its capital, Denpasar, is located in the part of the island. With a population of 3,890,757 in the 2010 census, and 4,225,000 as of January 2014, the island is home to most of Indonesias Hindu minority. According to the 2010 Census,83. 5% of Balis population adhered to Balinese Hinduism, followed by 13. 4% Muslim, Christianity at 2. 5%, Bali is a popular tourist destination, which has seen a significant rise in tourists since the 1980s. Tourism-related business makes up 80% of its economy and it is renowned for its highly developed arts, including traditional and modern dance, painting, leather and music. The Indonesian International Film Festival is held every year in Bali, in March 2017, Tripadvisor named the island the worlds top destination in its Travelers choice award. Bali is part of the Coral Triangle, the area with the highest biodiversity of marine species, in this area alone over 500 reef building coral species can be found. For comparison, this is about 7 times as many as in the entire Caribbean, most recently, Bali was the host of the 2011 ASEAN Summit,2013 APEC and Miss World 2013. Bali is the home of the Subak Irrigation System, a UNESCO World Heritage Site, Bali was inhabited around 2000 BC by Austronesian people who migrated originally from Southeast Asia and Oceania through Maritime Southeast Asia. Culturally and linguistically, the Balinese are closely related to the people of the Indonesian archipelago, stone tools dating from this time have been found near the village of Cekik in the islands west. In ancient Bali, nine Hindu sects existed, namely Pasupata, Siwa Shidanta, Bodha, Resi, each sect revered a specific deity as its personal Godhead. Inscriptions from 896 and 911 dont mention a king, until 914 and they reveal an independent Bali, with a distinct dialect, where Buddhism and Sivaism were practiced simultaneously. Central Java is a province of Indonesia. This province is located in the middle of Java, the province is 32,800.69 km2 in area, approximately a quarter of the total land area of Java. Its population was 33,753,023 at the 2015 Census, Central Java is a cultural concept that includes the Special Region and city of Yogyakarta as well as the Province of Central Java. However, administratively the city and its surrounding regencies have formed a special region since Indonesian independence. Located in the middle of the island of Java, the Central Java province is bordered by West Java, a small portion of its south region is the Yogyakarta Special Region province, fully enclosed on the landward side by the Central Java province. To the north and the south, the Central Java province faces the Java Sea, Central Java includes offshore islands such as Karimun Jawa Islands in the north, and Nusakambangan in the southwest. Yogyakarta is historically and culturally part of the Central Java region, the average temperature in Central Java is between 18–28 degrees Celsius and the relative humidity varies between 73–94 percent. While a high level of humidity exists in most low-lying parts of the province, the highest average annual rainfall of 3,990 mm with 195 rainy days was recorded in Salatiga. 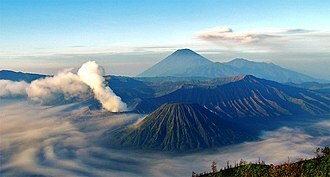 The geography of Central Java is regular with small strips of lowlands near the northern and southern coast with mountain ranges in the centre of the region, to the west lies an active stratovolcano Mount Slamet, and further east is the Dieng Volcanic Complex on Dieng Plateau. Southeast of Dieng lies the Kedu Plain, which is bordered to the east side by the volcanoes of Mount Merapi. South of Semarang, lies Mount Ungaran, and to the north-east of the city lies Mount Muria on the most northern tip of Java, to the east near the border with East Java lies Mount Lawu, where its eastern slopes are in the East Java province. Due to its volcanic history, volcanic ash makes Central Java highly fertile agriculture land. Paddy fields are extensive, except in the southeastern Gunung Kidul region partly due to the concentration of limestone. The Balinese are an ethnic group native to the Indonesian island of Bali. The Balinese population of 4.2 million live mostly on the island of Bali, there are significant populations on the island of Lombok, and in the eastern-most regions of Java. The Balinese originated from three periods of migration, the first waves of immigrants came from Java and Kalimantan in prehistoric times and were of proto-Malay stock. The second wave of Balinese came slowly over the years from Java during the Hindu period and this in turn reshaped the Balinese culture into a syncretic form of classical Javanese culture mixed with many Balinese elements. A DNA study in 2005 by Karafet et al. found that 12% of Balinese Y-chromosomes are of likely Indian origin, while 84% are of likely Austronesian origin, Balinese culture is a mix of Balinese Hindu-Buddhist religion and Balinese customs. It is perhaps most known for its dance and sculpture, the island is known for its Wayang kulit or Shadow play theatre. Even in poor rural and neglected villages, beautiful temples are a common sight, even layered pieces of palm leaf and neat fruit arrangements made as offerings by Balinese women have an artistic side to them. Balinese artists are skilled in duplicating art works such as carvings that resemble Chinese deities or decorating vehicles based on what is seen in foreign magazines. The culture is noted for its use of the gamelan in music, each type of music is designated for a specific type of event. For example, music for a piodalan is different from music used for a ceremony, just as it is for weddings, Melasti. The diverse types of gamelan are specified according to the different types of dance in Bali, according to Walter Spies, the art of dancing is an integral part of Balinese life as well as an endless critical element in a series of ceremonies or for personal interests. Traditionally, displaying of female breasts is not regarded as immodest, Balinese women can often be seen with bared chests, however, a display of the thigh is considered immodest. In modern Bali these customs are not strictly observed. In the Balinese naming system, a rank of birth or caste is reflected in the name. 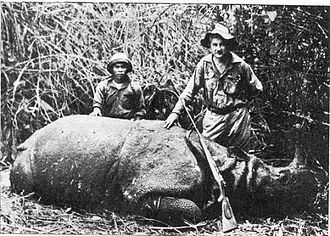 A puputan is an act of mass suicide through frontal assaults in battle, the latest act of puputan was during the Indonesian war of Independence, with Lt.
Ivory is a hard, white material from the tusks and teeth of animals, that can be used in art or manufacturing. It consists mainly of dentine ), one of the structures of teeth. The chemical structure of the teeth and tusks of mammals is the same and it has been valued since ancient times for making a range of items, from ivory carvings to false teeth and dominoes. Elephant ivory is the most important source, but ivory from mammoth, hippopotamus, sperm whale, killer whale, elk have two ivory teeth, which are believed to be the remnants of tusks from their ancestors. The national and international trade in ivory of threatened species such as African and Asian elephants is illegal, the word ivory ultimately derives from the ancient Egyptian âb, âbu, through the Latin ebor- or ebur. Both the Greek and Roman civilizations practiced ivory carving to make large quantities of high value works of art, precious religious objects, Ivory was often used to form the white of the eyes of statues. There is some evidence of either whale or walrus ivory used by the ancient Irish, solinus, a Roman writer in the 3rd century claimed that the Celtic peoples in Ireland would decorate their sword-hilts with the teeth of beasts that swim in the sea. Adomnan of Iona wrote a story about St Columba giving a sword decorated with carved ivory as a gift that a penitent would bring to his master so he could redeem himself from slavery. The Syrian and North African elephant populations were reduced to extinction, the Chinese have long valued ivory for both art and utilitarian objects. Southeast Asian kingdoms included tusks of the Indian elephant in their annual tribute caravans to China, Chinese craftsmen carved ivory to make everything from images of deities to the pipe stems and end pieces of opium pipes. The Buddhist cultures of Southeast Asia, including Myanmar, Thailand and Cambodia, Ivory was prized for containers due to its ability to keep an airtight seal. It was carved into elaborate seals utilized by officials to sign documents. In Southeast Asian countries, where Muslim Malay peoples live, such as Malaysia, Indonesia, in the Philippines, ivory was used to craft the faces and hands of Catholic icons and images of saints prevalent in the Santero culture. The Javanese are an ethnic group native to the Indonesian island of Java. With approximately 100 million people, they form the largest ethnic group in Indonesia and they are predominantly located in the central to eastern parts of the island. There are significant numbers of people of Javanese descent in most Provinces of Indonesia, Singapore, Saudi Arabia, the Javanese ethnic group has many sub-groups, such as the Mataram, Osing, Samin, Banyumasan, etc. A majority of the Javanese people identify themselves as Muslims, with a minority identifying as Christians and Buddhist influences arrived through trade contacts with the Indian subcontinent. Hindu and Buddhist - traders and visitors, arrived in the 5th century, the Hindu and Javanese faiths blended into a unique local philosophy. The cradle of Javanese culture is described as being in Kedu. The earliest Sanjaya and Sailendra dynasties had their base there. The move was most likely caused by the eruption of Merapi and/or invasion from Srivijaya. The major spread of Javanese influence occurred under King Kertanegara of Singhasari in the late 13th century, the expansionist king launched several major expeditions to Madura, Bali in 1284, Borneo and most importantly to Sumatra in 1275. Following the defeat of the Melayu Kingdom, Singhasari controlled trade in the Strait of Malacca, Singhasari dominance was cut short in 1292 by Kediris rebellion under Jayakatwang, killing Kertanegara. However, Jayakatwangs reign as king of Java soon ended as he was defeated by Kertanegaras son-in-law, Raden Wijaya would establish Majapahit near the delta of the Brantas River in modern-day Mojokerto, East Java. Kertanegara policies were continued by the Majapahits under King Hayam Wuruk. Various kingdoms of Java were actively involved in the trade in the sea route of the Silk Road. Although not major producers, these kingdoms were able to stockpile spice by trading for it with rice. Majapahit is usually regarded as the greatest of these kingdoms and it was both an agrarian and a maritime power, combining wet-rice cultivation and foreign trade. For the municipality in Albania, see Kalis, Albania. For villages in Poland, see Kalis and Kaliś, a kalis is a type of double-edged Filipino sword, often with a wavy section, similar to a keris. Just like the keris, the Kaliss double-edged blade can be used for cutting and thrusting, except that the Kalis is much larger than most Kerises, making it a sword rather than a dagger. It is believed that the predecessor of the keris first appeared in the 13th century, in Indonesia, versions of the kris can be found in Kalimantan and Sulawesi, where is it known as Sundang, Sondang or Sulu Keris. From there the kalis migrated to the Philippines, countries in which the kalis is considered to be one of the main weapons including Malaysia and some other countries in Southeast Asia. The kris is available in different shapes and sizes, the kris has a special blade that is straight at the top and has a wavy shape at the handle. All the Filipino types of swords are both larger and heavier than those from Indonesia. Although it is considered to be a weapon, the kris can be effectively used for thrusts. The kalis blade is defined as one that is wide on the base and it is capable of delivering both chopping and slicing cuts. Moro kalis blades generally range in size from 18 to 26 inches, generally however, the larger blades are found on pieces, while the oldest Moro kalis tend to be of smaller stature. Damascene patterning is sometimes evident though often not as controlled as seen in the pattern welding of the smaller Malay keris. The gangya of a blade is made in such a manner that their lines flow very elegantly into the blade. Antique kalis were made with a separate gangya like their Malay cousins, at some point near the early 19th century, gangya started to be made with a distinct 45-degree angle near the terminus. Opposite the hook-like fretwork on the gangya, exists a curved cavity, modern tourist kalis blades can be distinguished by a number of features that once identified are quite easy to spot. Perhaps the easiest to identify feature of a modern tourist/fake kalis blade are the shaping of the waves, traditional kalis feature gracefully undulating waves that are forged deep into the blade to penetrate straight to the centerline of the blade. A Neolithic dagger from the Muséum de Toulouse. Nagarakretagama palm-leaf manuscript. Composed by Prapanca in 1365, it provides a primary historical account of Majapahit court during the reign of King Hayam Wuruk. Painting of a 14th-century Yuan junk. Similar ships were sent by the Yuan in their naval armada. The statue of Parvati as mortuary deified portrayal of Tribhuwanottunggadewi, queen of Majapahit, mother of Hayam Wuruk. 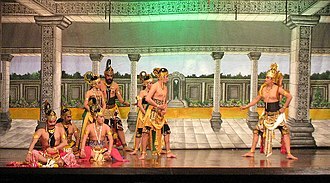 Javanese adapted many aspects of Indian culture, such as the Ramayana epic. Example of Javanese cuisine. Clockwise: fried tempeh, mlinjo crackers, gudeg with rice wrapped in teak leaf, green chili sambal and sliced lime. Nasi tumpeng, the quintessentially Javanese rice dish, symbolises the volcano. 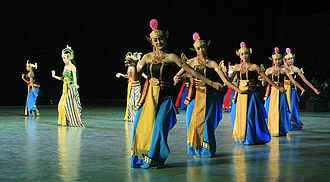 Jaipongan Mojang Priangan, a Sundanese traditional dance performance. Batutulis inscription in Bogor, describes the deeds of Sunda King, Sri Baduga Maharaja, popularly known as Prabu Siliwangi. Sundanese boys playing Angklung in Garut, c. 1910–1930. Akad nikah, Sundanese Islamic wedding vows in front of penghulu and witnesses. Balinese people bring offerings to the temple. Balinese women preparing for a religious festival. A Makassar mosque in the colonial period, 1930s. Young Makassar woman in traditional clothes (baju bodo) in the colonial period, 1930s. Moro kris (kalis) nomenclature, given in Tausūg, Maranao, Visayans, and Maguindanao. 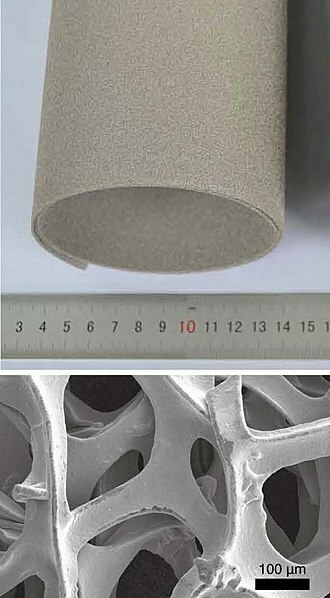 In this example, the blade's lamination pattern can be seen. The darker high-carbon cutting edge of the blade can also be noticed. The said harder high-carbon cutting edge is termed as "sinubo" (roughly, sandwiched). The demarcation line indicating the separate gangya (guard) can be seen. Two Filipino swords, a kampilan (longer) and a kalis (shorter), photographed side by side to demonstrate their size relative to each other. Silver pattern welded rapier guard, from between 1580 and 1600, with reproduction blade. Germany 19th century: Various colours and tassels of sword knots. German cavalry officers' Stichdegen (dress sword) with sword knot, or Troddel. When worn, the sword knot is wrapped around the sword guard, or sometimes looped though a slot in the guard. Details. Gilded chapter separator in Serat Selarasa, folio 10r. 18th-century. Kandapat Sari statue in Semarapura, one of the old settlements in Bali. Historically, Balinese art and culture is born and based in this town. Landscape of the Serayu River Valley, with Mount Slamet in the background. The Yogyakarta sultanate palace's main pavilion. The five Pandawa brothers from the Hindu epic Mahabharata, narrated in the Javanese Wayang kulit. 19th century studio portrait of a native Javanese warrior. Javanese "peasant army" consist of lightly equipped troops like this. 21st century view of Brantas river in Kediri. Depiction of a Javanese jong from 1500s. Jong was the main naval ships of Javanese kingdoms. The serene beauty of Prajnaparamita statue found near Singhasari temple is believed to be the portrayal statue of Queen Ken Dedes, wife of Ken Arok (the collection of National Museum of Indonesia). Singhasari temple built as a mortuary temple to honour Kertanegara, the last king of Singhasari. A Madurese batik maker in Tanjungbumi, Bangkalan, Madura, Indonesia. Bull racing (karapan sapi) in Sumenep, Madura, East Java, Indonesia, 1999.